I have been blogging for two and a half years and have never had a guest poster, but that is about to change. I am introducing a new series I want to start where YOU share pictures of your favorite room and tell us why it is your favorite. I'm calling the series "My Favorite Room". 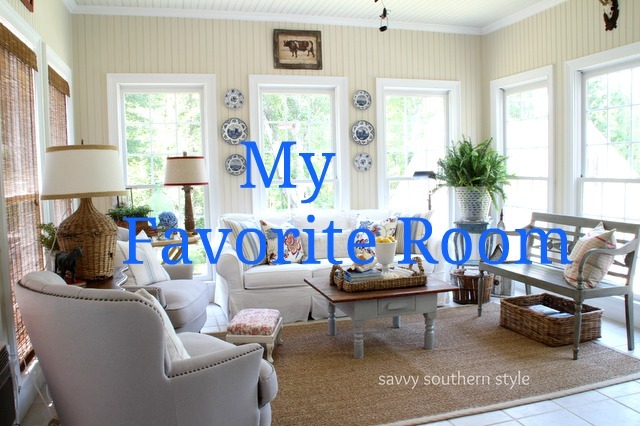 Yes, my sun room is my favorite, but we want to know what YOUR favorite room is? I will be emailing several bloggers to invite them to share their favorite room so be checking your email. This series will start the first weekend of August. Sounds like fun. I can't wait to see all the rooms. I just knew that would be your favorite room! It would be mine too. I'm looking forward to participating. Guess I need to get busy then. Sounds like a fun series, Kim. I know there will be lots of inspirational rooms to see. I love your sunroom, btw. Hi Kimmie! Oh, this sounds like a great idea! I know your sunroom is one of my favorites. I love this idea, getting a personal look at favorite spaces and why they love it. Looking forward to it! What a great idea, Kim! Let's get an up close and personal look at what our favorite bloggers love about their homes! I'm hoping to learn a lot! I love your sun room too... it's always evolving and changing!!!! You have such a gorgeous home, it would be difficult for me to pick a favorite room that you've shown. But, like you, our sun room is a favorite around here too. That's where we spend most of our time, except in the winter when we are in the living room by the fire. Great idea for a new series, Kim. What fun. My favorite room is what ever one is clean! Hi Kim, I love your sunroom too but it's hard to pick a favorite! Sounds like a fun series. Sounds like a fun series, Kim. I am looking forward to seeing all the favorite rooms. You have another great idea Kim. Looking forward to seeing everyone's favorite rooms. Fun idea and looking forward to seeing everyone's favorite room! Love you sun room! What a fun idea, Kim, can't wait to get a peek in everyone's favorite rooms. I suppose it would be a little weird for me to write about your sun room- ha! Such a great idea, Kim, I love series like these - and I can see why your sunroom is your favorite room too - so pretty! Great idea~everyone has a favorite room! Great idea my favorite rooms are my great room, living, bedroom and dining room. Sounds like fun! Looking forward to this series. Great idea! I love seeing well designed rooms on blogs. They're my favorite posts! Looking forward to your new series! I can see shy this is your favorite room! It is gorgeous. I didn't think you could improve it, but I love it even better now! Great idea,this sounds like so much fun! I love your sunroom,fact I love all sunrooms it just seems to be such a happy place always...count me in on the fun. I'm a relatively new reader and I just wanted to say, I love your sun room! Just love it. Pinning it now! I am excited! I know I will be inspired by the rooms that are shared. I LOVE your sunroom! That is on my wish list for a someday project! Great idea Kim! I love your sunroom, living room, kitchen...oh, and the dining room! I will look forward to seeing all of the great decorating ideas from the features you share! Great idea! I am looking forward to seeing everyone's favorites room - it really will give you a glimpse into the writer's personality too! I would love to be included Kim! Keep me in mind. Your sun room is one of my favorites in your lovely home. That't going to be so much fun kim. My favorite room in your house is the guest room where I have envisioned myself having breakfast in bed on those crisp sheets (do you iron them? )...and of course I love all the light in your sunroom...gorgeous. What a great idea. This will give us another great site to get inspiration from. I am such a copy cat...love to copy...and I have been working on a mantel today...not finished. Have guest coming over to eat pizza and strawberry cake. Your sun room is my favorite...no wait...your guest room...no wait...your kitchen....no...the master bedroom....I don't know how you can decide which is your favorite. Great idea, Kim! Can't wait! Great idea! Sounds exciting, Kim. I am looking forward to your features. Ooh! I love your sun room! Its full of light and comfort, along with all your great decor! I know I don't live in your house but my favorite room (hands down) is your dining room. I never, ever tire of seeing it. Great idea for a series too. I LOVE your sunroom - and what a great idea! Looking forward to the series! I can see why! I think we ALL love your sun room :) What a fun idea... everyone likes to share. Oh I can't wait to see all of your guests!! And the sunroom is SO pretty too!